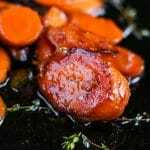 These easy honey glazed carrots are made on the stovetop with a simple butter, honey and thyme recipe that is perfect for every day, or the holidays! In a large skillet (I used a 12 inch), heat 2 tablespoons of the butter until melted. Add carrots and cook lightly until they start to brown a little bit, about 5 minutes. Add the water (or broth) and the honey. Stir to combine and bring the water to a boil. Reduce the heat and simmer on low until the carrots become tender about 30 minutes. Check the water throughout this time and add more if it gets low. When the carrots are tender and the liquid is reduced and thick (about 1/3 cup left), remove from the heat and add the remaining tablespoon butter, thyme, salt, and pepper. Baby carrots or whole carrots can be used.